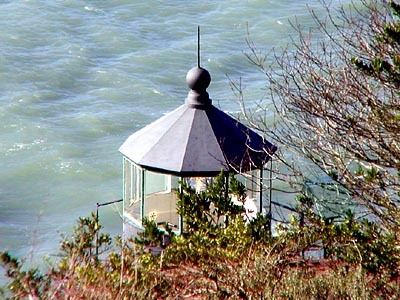 From the viewing platform below the cross on Trinidad Head is this partial view of the working lighthouse. With binoculars from south of town, you can see that the lighthouse sits atop the west end of Trinidad Head. Trinidad Head Light is open to the public during the annual Trinidad Fish Festival in June.